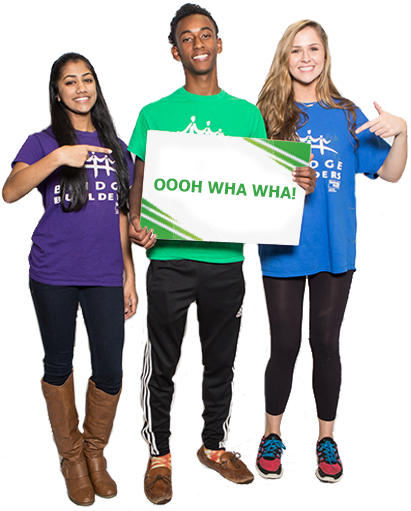 The support of BRIDGES’s generous donors has changed the lives of thousands of Bridge Builders youth. Matthew, a 17-year-old senior at Christian Brothers High School in his fifth year of participation in Bridge Builders COLLABORATE, is just one of them. 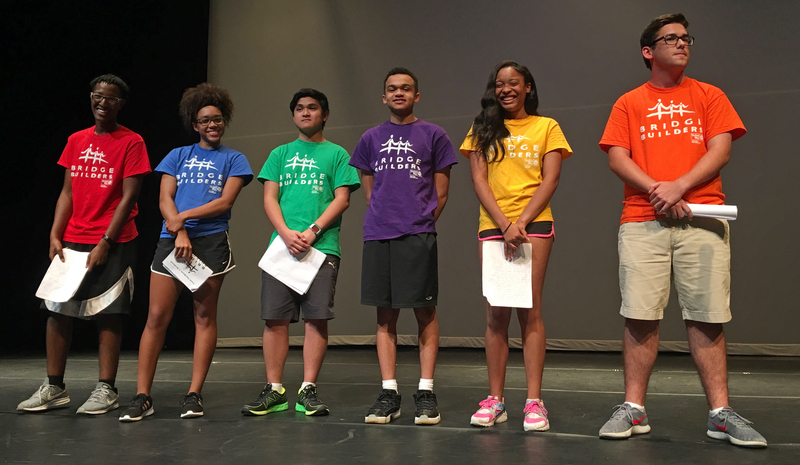 Matthew Lamanilao (back row, far left) with his 12th grade Bridge Builders COLLABORATE cohort, the Emerald Gracelands, at 2018 summer conference. Matthew Lamanilao took a deep breath as he stepped into the spotlight and waited for the cheers to die down. On the last day of his final Bridge Builders summer leadership conference, he’d been selected by his team to represent them with a speech at the closing induction ceremony. “My mother immigrated to America alone from the Philippines,” he told the crowd of family, friends, alumni and supporters. “In college, she wanted to major in biology and become a doctor, but due to unforeseen circumstances, she had to change her future for the sake of mine. Matthew’s journey to self-discovery started back in 7th grade as a first-time Bridge Builder pushed into the program by his mother, Maria, a physical therapist at the Memphis Veterans’ Affairs Medical Center, and his older brother, Gene. Matthew struggled with intense shyness, even in his intimately small class of 10 students at Our Lady of Perpetual Help Middle School. Through his participation in Bridge Builders, Matthew’s confidence skyrocketed, and over his 7th and 8th grade years he grew into a much more outgoing leader at OLPH. But going from a school with a total student body of 150 to Christian Brothers High School, with 900 students, knocked him for a loop. “I got back to my pre-Bridge Builders state, where I would stick to myself,” he said. “I was kind of a minority there, being Asian in a predominately white school, and I would sometimes get bullied or picked on because I was different. So freshman year wasn’t really all that great. The Matthew of the future plans to major in engineering, and he’s exploring schools like Georgia Tech, MIT, and Caltech. “There’s this theme in my life, actually, of Bridge Builders influencing everything from my behavior all the way to my career choice,” he said. In his junior year summer conference group, Matthew met Calvin Gott, an African-American student from Arlington High School. Matthew still keeps in touch with Calvin, but also thinks he still has more work to do in becoming a more communicative and outgoing person in order to excel in college and his career. “I have to establish connections to be a good engineer, and the foundation of that will definitely be my history with Bridge Builders,” he said. “BRIDGES plays the leadership card very often; I mean, that’s what they’re about. 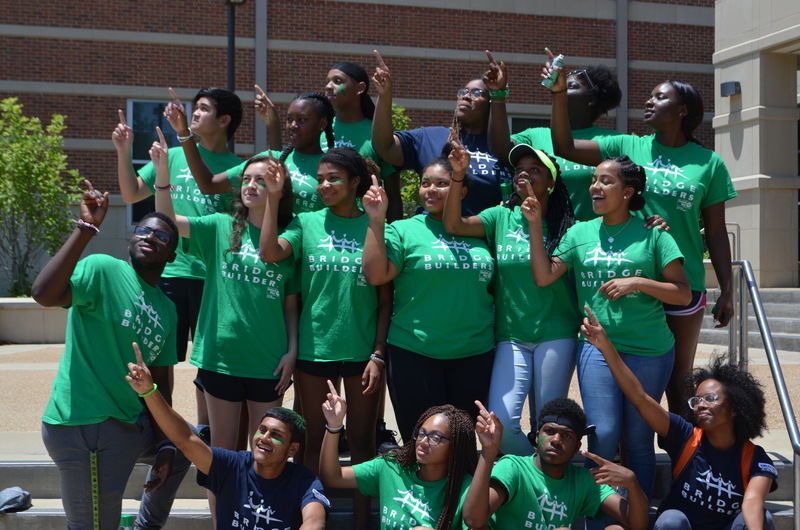 But in order to develop those leadership skills, it’s a program that brings together a bunch of diverse individuals, and that’s what I love about Bridge Builders. And that’s what Matthew chose as his overarching theme for that final induction ceremony speech. “After five years in this extraordinary program, it still amazes me how Bridge Builders has the ability to bring together a group of unfamiliar teens like they were the best of friends, or even a family, all within a week,” he said confidently into the lectern mic. “We all toured the Civil Rights Museum together. We all did the ropes course together. We all slept through an hour-long presentation together. We all laughed together. But most importantly, we all changed together.